Find a Home Furnishings Retailer Near You! Please Note: furnishingretailers.com operates stores in the area. We do NOT deliver outside our service area and the immediate surrounding areas at this time. We will NOT quote prices outside of this area. The large top pillow correlated with the lower lumbar pillow and super soft arm pillows have been superbly designed to completely envelop the user. Combined with a plush chaise seat, sweeping double rimmed arm post and supple, tantalizingly soft leather, the Stockton will supply enjoyment for years to come. This is the Latitudes version of the 3093. 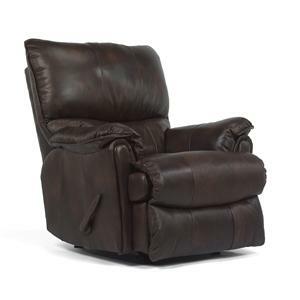 The Accents Stockton Rocking Recliner by Flexsteel is available in the area from furnishingretailers.com. Browse other items in the Accents collection from furnishingretailers.com in the area.